Eoslift USA Superior Scissor Lift Pallet Truck is constructed with only high quality materials and craftsman-ship. New German Seals System, 2200 lbs. weight Cap., Fork-27 in. x 45 in., Polyurethane Wheels, Steel Hubs, Padded Handles, Raise Height 31.5 in. 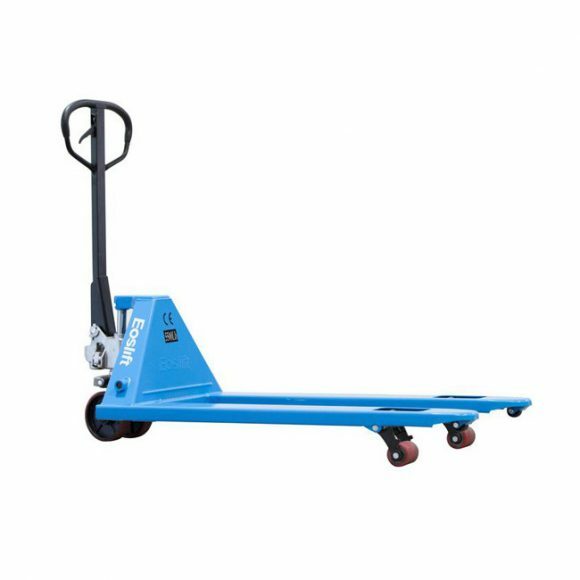 Scissor Lift Pallet Truck has several features that makes it stand out as a dependable product. Using modern robotic welding technology, this truck provides a superior finish and durability. The forks are ruggedly built with C-channel formed steel. A solid, chrome-plated ram and piston minimize corrosion while the fully enclosed pump seals out contaminants and prevents oil leaks. The overloaded valve is designed to prevent misuse and increase longevity, and the whole unit provides easy access to lubrication points for easy maintenance. The German-engineered high quality poly seals ensure excellent performance. When the forks are elevated to 8 inches, an automatic brake mechanism activates to ensure safe operation. The forks can be lifted to a height of 31.5 inches. The 7″ poly steel wheels are designed to provide exceptional maneuverability, while the pallet enty/exit rollers and tapered fork design offer easy and fast pallet entry and exit. This pallet truck uses a standard handle with an ergonimic loop design to reduce fatigue and operators, and the hydraulic handle offers three control positions for lift, lower, and neutral. Designed to load and unload goods for feed printing, punch presses, and many other creative applications. 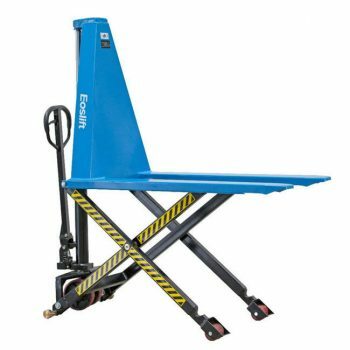 A dynamic combination of pallet truck and table truck, often used as an ergonomic worktable. Single or double cast pump with durable valve cartridge. 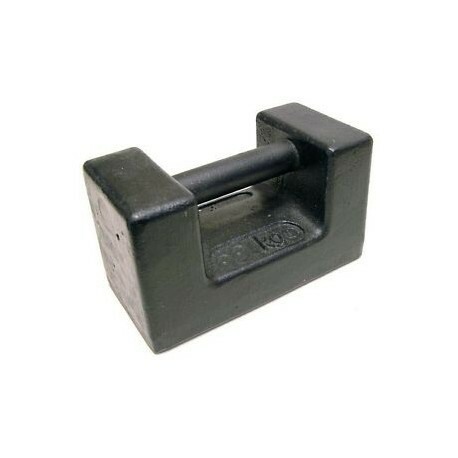 Overload bypass valve impedes lifting of loads beyond the rated capacity. Top-of-stroke bypass secures the hydraulic system. When loads exceed 15.7” (400mm), the stabilizing legs automatically extend to restrain truck movement. Capacity Lb. 2200 2200 3300 lb. Fork O.A.W. In. 21.3/26.8 20.5/26.8 20.5/26.8 in. Fork Length In. 45.3 44.9 43.3 in. Lowered Fork Height In. 3.35 in. Raised Fork Height In. 31.5 in. Lift Height In 28.15 in. Service Weight Lb 275/286 231/246 260/275 lb. Over all length In. 59 in. Load Wheel In. Φ2.95×1.97 in. Steering wheel In. Φ7.09X1.7 in. Single Fork Width In. 6.38 in. Ground Clearance In. 0.71 in.